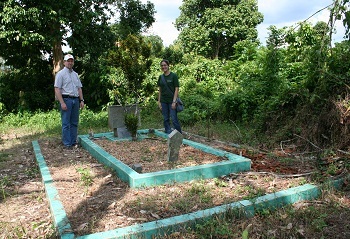 C. & C. at the grave of Datuk Sintai. In the City of Jambi, on the north side of the Batanghari River, there is an area that is famously referred to as “Sebarang” (the other side… of the river). In Jambi newspapers it’s common to see that area referred to with its abbreviation: “Sekoja” (Sebarang Kota Jambi—the other side of the river from the City of Jambi). Located in this area of Jambi is the grave of a famous Islamic missionary (pendakwah) who was said to have arrived from China during the 1600s. The man’s name was Datuk Sintai, and his grave is located in the city’s district (kecamatan) named Pelayangan, and specifically in the sub-district (kelurahan) Mudung Laut. The exact location of the grave can be found by clicking on this link.